It’s no secret that we’re fans of street artists David “Shek” Vega and Nik Soupé. Five years ago, the longtime collaborators gave our formerly anonymous headquarters a stylish makeover with an intensely colorful mural fusing their own distinct styles: swirling, sinuous patterns (Shek) and imaginative yet realistic portraiture (Soupé). In the years that followed, the dynamic duo have left lasting marks across San Antonio (and in Austin) in the form of large-scale murals created for hometown faves like the Mix, Bottom Bracket Bicycle Shop, Rudy’s Seafood and Paramour as well as bigwigs such as Spurs Sports & Entertainment, H-E-B and Google Fiber. 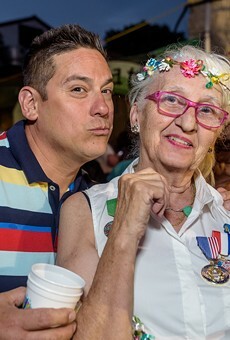 In 2017, Los Otros got tapped by Red Bull to create three Fiesta-themed murals — two along the St. Mary’s Strip and one at the Fiesta Commission’s headquarters on Broadway. 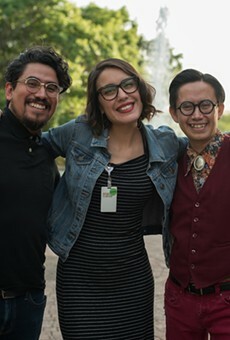 Engaging the community through social media, they invited their followers to submit their favorite Fiesta photos for potential use as visual inspiration. 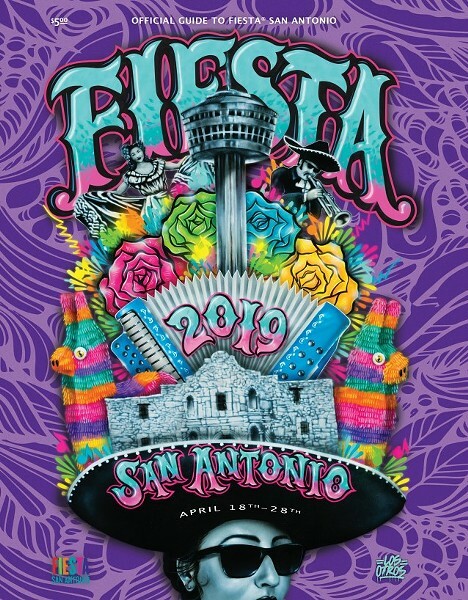 Something of a natural progression, Los Otros’ working relationship with the Fiesta Commission hit a high note this year when the pair got invited to create the official Fiesta poster for 2019. Given creative freedom, they came up with what’s easily one of the youngest, hippest looks Fiesta has ever adopted. Titled Traditions and rendered entirely in spray paint (save for the hard outlines on the letters and the filigree-style background), the design stacks the Alamo, the Tower of the Americas, piñatas, flowers, an accordion, a folklórico dancer and a mariachi atop one of spring’s most whimsical accessories: a towering Fiesta hat. In addition to its appearance on the official poster ($9.99-$27.99 at shopfiesta.org), the Los Otros design can be found on a wide assortment of Fiesta keepsakes.